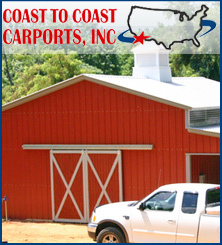 Browsing articles tagged with " barns with steel frame"
A steel frame barn made by Coast To Coast Carports, Inc., is an excellent choice for farmers who want superior protection for their livestock. The premium steel we use to make barns, and other agricultural buildings, will give your building a significant number more years of use than buildings made out of other materials. Our barns will protect your livestock from harsh temperatures, fires, flooding, predators, and thefts. We have been providing thousands of farmers, just like you, with high quality buildings at the most affordable prices. We make sure that you will get your money’s worth in quality and durability when you choose to purchase a steel frame barn from us. Coast To Coast will let you customize your barn, and make it entirely your own. You can start by choosing the size and shape of your barn. Next, you can choose the roof style, doors, windows, and the color. We understand that every farmer has unique needs for their barn, and we will do our very best to make sure that you are satisfied with your purchase. You can feel confidant that your steel frame barn from Coast To Coast is an investment that will add a significant amount of value to your property. Our steel barns are not only efficient and durable, but they also have a fine looking exterior that will make your farm stand out from others. The fine steel we use to make your barn will protect it from corrosive damage, with minimal upkeep required on your part. Give us a call, and talk to one of our friendly representatives today, and find out more about our barns will be of benefit to you.